The aim of “Taiwanese Association of Sign Language Translation Interpreters (TASLI)" (the Association) is to organize Taiwanese sign language interpreters to create a professional group in order to better serve the deaf, building a bridge to communicate the deaf and the hearing within Taiwan. The Association aims to promote the development of sign language interpreting professionalism in Taiwan, to establish sign language interpreting service standards, to improve the sign language interpreting system, to train high-quality sign language interpreters and to support sign language interpreting academic research in order to enhance the quality and quantity of sign language interpreting and to progress the rights and welfare of the deaf. 1. Since its inception in 1993, 375 people in Taiwan have been successfully certified through the sign language interpreter skills examination. However, currently there is no professional organization in Taiwan to safeguard the rights and interests of sign language interpreters, to integrate the resources for the sign language interpreting, and to provide advanced training opportunities for these active interpreters. 2. The practitioners of sign language interpreting are very much in need of close collaboration and mutual support to participate in updated training and improve sign language interpreting skills and knowledge to establish operation guidelines for sign language interpreters. 3. Taiwan needs to develop a high standard of professional ethics for sign language interpreters to meet the expectation of the deaf community and general population. The establishment of professional and ethical standards will build the professional image of honesty, impartiality and confidentiality for sign language interpreters. 4. In order to provide the long-term support for sign language interpreters, the establishment of the professional organization is critical needed to secure the basic rights and interests of sign language interpreters, such as, insurance, working hours, remuneration and other benefits. The Association can also offer a sense of belonging for sign language interpreters to create an improved employment environment. 5. There are still misunderstandings about the sign language interpreting, such as “interpreters are sign language teachers”. Some people think that sign language interpreters are “entertainers" and other misconceptions that need to be clarified through the organization’s voice. Through the effort of the sign language interpreting professional association, these societal bias and misconceptions can be effectively addressed. 6. The Association will provide independent assessments for the annual sign language interpreter test question bank and test administration, to collect domestic and foreign interpreter license information, aiming to maintain scientific, fair and objective sign language interpreter testing and grading standards to establish the credibility of the professional license process. 7. The Association will establish the database for domestic and foreign sign language translation related to the rules and regulations, information law, translation of new knowledge, major news events and other reference materials, in order to provide sign language interpreters with updated professional knowledge and information. 8. The Association will provide sign language teachings, studies, and interpretations seminars periodically or irregularly to facilitate the inter-communication between domestic and foreign groups in order to further the opportunity for communications, advanced studies and updated information for sign language interpreters, teachers and the parents of the deaf persons. 9. Sign language interpreters serve as important bridges to promote hearing and hearing people. Through the Association, sign language interpreters can enhance the quality and quantity of professional services with the advanced professional knowledge and level the distribution of sign language interpreting service to reach urban and rural balance, so all hearing impaired can communicate sufficiently with the hearing to share a harmonious and prosperous society. The quality of local sign language interpreters has been greatly improved through the activities of these local associations. 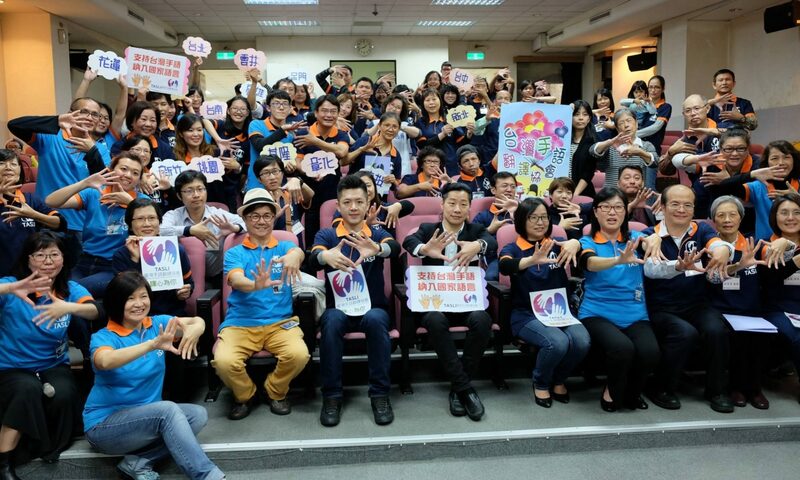 Encouraged by the sponsor’s article, the Chairman of Preparatory Committee commenced the effort to establish Taiwanese Association of Sign Language Translation Interpreters (TASLI). “Organization leads to the power“, sign language interpreter association sponsors including deaf friends and special education teachers all over the country. As a sign language interpreter yourself, if you agree with the concept of the Association and support the idea that Taiwan needs its own sign language interpreter organization, please join our effort to create the sign language interpreter association to work together to build a better future environment for sign language interpreters for Taiwan. On March 18, 2017, our dream has finally comes true. I started to learn Taiwan Sign Language 30 years ago. At that time, many people often asked me – “Why do you learn Taiwan Sign Language?”, for Taiwan Sign Language was rarely an interest thing to me at that time. After 30 years, many people often asked me – “Why do you establish ‘Taiwan Association of Sign Language Interpreters?’”. Many people do actually not know that we, Taiwan Sign Language interpreter, desired to have a real “HOME” for a long time. In the early time, Taiwan Sign Language was regarded as a volunteer or a teacher. It means that you should have a love of Taiwan Sign Language interpreting without asking for money. Later, it gradually have the hourly charges. We are sometimes asked for a donation and said “Money Grubber”. In fact, we love Taiwan Sign Language with the heartfelt heart also the expectation in serving Deaf people. This is why we continue to strive for the excellence in Taiwan Sign Language and professional interpretation skills. A Skill Certification Course of Taiwan Sign Language Interpretation was opened by Skill Evaluation Center of Workforce Development Agency, Ministry of Labor since 2004 as it was officially recognized as a profession. There are already 375 trained and certified Taiwan Sign Language interpreters in 13 years, but we do not still have any organization or association that stands up for Sign Language Interpreters by its the perspective also provides mutual supports and cooperative trainings in enhancing the professional knowledge and the development of the sign language interpretation under the positive environment and vision. One of the Taiwan Sign Language interpreters said this to me. After one Deaf friend applied for the memberships, he told me that his Deaf family was tragically broken down by a sudden emergency, and it was the tolerance for them with no resource in helping them to communicate. In the meanwhile, if there is one Taiwan Sign Language interpreter, his Deaf family is now absolutely not the same. I would like to inform all Taiwan Sign Language interpreter. Deaf friends expect our interpretation so deep also the big demand. Whether you are on TV, in hospitals, school, or families, we always must respect our role that provide the high-quality, faithful, and neutral interpretation in securing Deaf friends’ rights and enabling Deaf friends to participating in society. 2. Chung Ching YEH who is appointed the principal of Taipei School for Hearing Impaired. I am thankful to him as the supportive role as a father in providing the venue without any hesitation and ensuring us to gather together and celebrate the establish of “Taiwan Association of the Sign Language Interpreters” together today. Moreover, this is particularly meaningful as it shall be the 100th anniversary of Taipei School for Hearing Impaired this year. 3. Chuan-Huei CHEN, Director of “Listening Eyes”, Taiwan Public Television Service. She is always the first person who stands up for me whenever I am wronged, and she is always the large-hearted for me at works. One of my colleagues, Mr. Li-Yu CHEN, has informed me about the views from Deaf community and assisted me in graphic design and video editing for Taiwan Association of Sign Language Interpreters. 4. My best friend and buddy, Mr. Joseph MIAO, run an interior design company that always win the first place in most design competitions. When I left my message to him via LINE and asked for his favor in sponsoring the clothing, “Of course, No problem at all” he replied back within 10 seconds! 5. My “Happy” husband, Mr. Ju-Yi LEE, is the professor at a university, and he is fully supportive to me with no doubt. He tells me that he has been done so many experiments and wrote so many dissertations, but it might not be meaningful and the positive impact to the society than my actions into establishing this association So far, I could not express how thankful I am to the members and staffs of this preparatory committee that works with me together since last November, 2016. I want to ask them to be on this stage with me now. (Applauses) Honestly, I never work with them even do not know who they are in the past until we work together since last November, 2016. During the 4 months, we have already become good friends. At this moment, what you see and what you have is the great outcome from these Deaf and Hearing friends with their own expertise designed. Of course, we shall face the ups and downs also the pressures from outside together. Let’s applauses to all of us right now and right here. From now on, no matter how hard you get through under the hardships, how many doubts you have for sign language interpretation, or how much you desire for the fair and warm support, please do not forget that we have a “HOME”. Taiwan Association of Sign Language Interpreters is our home forever. Description of Design：Two hands holding the earth to shape the appearance of Taiwan island with emerging colors to express the cooperation and cultural unity between the hearing and Deaf community. Article 1. The name of this association shall be the Taiwanese Association of Sign Language Interpreters (TASLI). In order to promote the quality of sign language interpretation, the association is founded to advance the development of sign language interpretation profession, set up service standards, improve the sign interpretation system, train high quality interpreters, and promote academic research on sign interpretation. Article 2. The association is a non-profit social association, set up according to the Civil Association Act of Taiwan. Article 3. The association is a national organization. Article 4. The site of the association is registered on the region of the official authorities, which grants the permission for the establishment of regional organizations. The composition of regional organizations must be approved by the board of directors and granted by official authorities. Further the profession of sign language interpretation and facilitate the communication between the Deaf/hard-or-hearing people and hearing people. Promote the quality of sign language interpretation and protect the right of the individuals who receive the service to have access to complete and accurate information. Advance the profession of sign language interpretation through collaborative training, mutual support and training courses. Establish the Code of Professional Conduct and ethical standards for sign language interpreters to maintain the core value of sign language interpretation. Promote and support of the rights and interests of sign language interpreters. Oversee the system and regulations of sign language interpretation certification and provide recommendations for system improvement and regulation modifications. Collect relevant information about sign interpretation and publish training materials and organizations newsletters. Hold academic symposiums and activities related to sign interpretation. Publicize relevant laws and the use of sign interpretation service. Cooperate with domestic and international deaf or sign interpretation groups to share experience. Participate in the governmental meetings to encourage and improve the sign language interpretation system. Other business that are related to the association’s missions and objectives. Article 6. The competent authority of the association is Ministry of the Interior, and the missions and objectives of the association shall be supervised by the purpose business authority, the Ministry of Health and Welfare. Individual Member: Any individual who is at least 20 years-old, agrees with the objective of the association, cares about the advancement of sign language interpretation and enthusiastically involves in activities of the association. Organizational Member: A public or private institution or group registered to government, agrees with the objective of the association. The corporate member should assign a representative to execute the membership right. Sponsored Member: Associations or individuals who sponsor the association and approved by the board of directors. Honorary Member: Associations or individuals who have special contribution to the association and approved by the board of directors. Permanent Member: Any individual who is a qualified Individual Member and submit permanent membership fee. Individual Member, Organizational Member and Permanent Member should file the membership application form and submit the membership fee once approved by the board of directors. Article 8. Members (representatives) have the right to vote, elect, be elected and to recall. Each member (member representative) may take one vote. However, Honorary Member and Sponsored Member do not carry the previous right. Article 9. Members should follow the association’s regulation, decision, and submit the membership fee. Members who did not submit membership fee can not carry the rights of being membership. Members who did not submit membership fee for three consecutive years are regarded as withdrawal. Members who withdraw from the association or are suspended for carrying the rights, should submit previous accumulated membership fees in order to restore the rights, unless granted by the board of directors with justified causes. Article 10. If members (member’s representatives) violate the law, bylaws, or against the decision of member meetings, the board of directors shall give him/her a warning, or suspend his/her membership. When the situation is seriously threatened to the majority, (s) he will be deprived from the membership according to the decision of members’ meeting. Article 11. Members who lose his/her membership or were deprived from the membership by the members’ meeting is regarded as dismissed from the association. Article 12. Members can withdraw from the association by submitting written statement. Article 13. The member meeting of the association is the supreme authority. Once the headcounts of members exceed 300 people, the association may elect the regional representatives according to the proportion of regional of members, and then launch representative meeting. The term of service for regional representatives is three years. The number of regional representatives and election regulation are decided by the board of directors and must be reported to the official authorities. Elect and recall directors and supervisors. Decide the amount and protocol for paying the enrollment fee, annual membership fee, permanent membership fee, career fee and member donations. Resolve annual work planning, report, budget and final accounts. Resolve the elimination of membership. Resolve the disposition of properties. Resolve any significant incidents related to members’ rights and obligations. Significant incidents are decided by the board of directors. Article 15. The board of directors shall be comprised of fifteen directors and five substitutes; the board of supervisors shall be comprised of five supervisors and one substitute. They all are elected through member meeting. When there is vacancy of directors or supervisors, the substitute will replace the position in a sequence until the fulfillment of term of service. Current board of directors can nominate candidates for next term of directors and supervisors. Elect or recall executive directors and the president. Approve the resignation of board members, executive directors, and the president. Draw up annual work plan, report, budget and final accounts. Article 17. The board of directors shall elect five executive directors, one of them shall then be elected by the board as president of the association. The president represents the association, supervises and manages all internal affairs of the association, and chairs the members’ meeting and the board of directors. If the president is unable to assume his/her duties, he/she shall appoint one executive director to assume all duties of the president. If the president did not or was unable to appoint one director to assume his/her duties, one of the executive directors shall be elected to assume all duties of the president. Whenever there is a vacancy for the president or executive directors, the position shall be filled within one month by election. Article 18. Authorities of the board of supervisors are as follows. Monitor the board directors’ execution process. Elect or recall executive supervisor. Article 19. The board of supervisors has one executive supervisor elected among supervisors. The executive supervisor monitors daily business in the association, and chair the board of supervisors. When the executive supervisor is unable to carry his/her duties, one supervisor shall be appoint to assume the duties. If the executive supervisor did not or was unable to appoint one supervisor to assume his/her duties, one of the supervisors shall be elected to assume all duties of the executive supervisor. Whenever there is a vacancy for the executive supervisor, the position shall be filled within one month by election. Article 20. Directors and supervisors in the association all are positions of no pay. The term of service is three years. The term system of office can be candidate and reelected continuously. The president can be elected once as limit. The term of service for directors and supervisors begins from the date of the first meeting for the directors and supervisors. Resigned due to certain reasons and approved by the board of directors or the board of supervisors. Suspended from the rights for a term of longer than a half of the tenure. Article 22. The association hires one secretary general and staff members to handle the business in the association according to the assignments from the president. The employment of secretary general and staff members shall be approved by the board of directors and report to the regulating authority for examination. The dismissal of the secretary general shall also be reported to the regulating authority for examination. The staff members as mentioned cannot be appointed from elected employees. The responsibilities and missions of staff members are decided by the board of directors additionally. Article 23. The association may set up any committee, groups or internal organizations. These internal organizations are decided by the board of directors. Article 24. The association may engage one honorary president, several honorary directors and consultants under the agreement of the board of directors. Term of service is the same as the directors and supervisors. Article 25. The members’ meeting is divided into two types: periodical meetings and temporary meetings, and both shall be convened by the president. To call a meeting of members, the association shall give notice to members fifteen days in advance. However, this is not applicable where a temporary meeting is called due to emergency. The periodical meeting shall be held once a year, and the temporary meeting will be arranged by request of the board of directors, or when 1/10 members (members’ representatives) appeal for meetings, or requirement letter from the board of supervisors. Article 26. When a member (member’s representative) cannot attend the members’ meeting in person, he may entrust in writing another member (member representative) to represent him; each member (member representative) may represent only one other. Formulation and amendment of the bylaws. Dismissal of a member (member representative). Recall of a director or supervisor. Other important matters related to the rights and obligations of the members. Article 28. The board of directors and the board of supervisors shall hold a meeting at least every six months, and may hold a temporary meeting when necessary. The meetings shall be notified to directors and supervisors seven days in advance. A resolution of the meeting needs the attendance of more than one half of the directors or the supervisors and the consent of more than one half of the attendees. Article 29. The directors or supervisors shall personally attend the meetings of the board of directors or the board of supervisors, and may not entrust others to represent them. Absence without due reason for two consecutive times will be regarded as resigning, and the vacancy will be filled by the alternate directors or alternate supervisors in sequence. Admission fee: 500 NT dollars for Individual Member; 1000 NT dollars for Organizational Member; No admission fee is required for Sponsored Member, Honorary Member and Permanent Member. Membership fee: 500 NT dollars for Individual Member; 1000 NT dollars for Organizational Member; 10000 NT dollars for Permanent Member; No membership fee is required for Sponsored Member and Honorary Member. Article 31. The Fiscal year begins from January 1st to December 31st of every year. Article 32. The association shall compile reports on budgeting and final accounting two months prior to the fiscal year each year, submit it to the members’ meeting for approval, and report it to the regulating authority for examination and reference. In addition, a final accounting report shall be sent to the board of supervisors for auditing first, and then submitted along with the result of the auditing to the members’ meeting for approval, and report it to the regulating authority for examination and reference before the end of March. Article 33. The rest properties belong to the local self-government group or any institute assigned by the official authorities after the disincorporation of the association. Article 34. Matters that are not stipulated in the bylaws shall follow all other relevant laws or rules. Article 35. Bylaws and later modifications of them must be approved by the members’ meeting and verified by official authorities. Article 36. Bylaws of the association were approved by the first members’ meeting of first members on March 18th, 2017, and verified and backed up as number 1060026052 by Taiwan’s Ministry of the Interior on April 19th, 2017. Follow the description to apply for the membership request the individual or group membership application. I. Download the application form & fill out the form, then send the form to the Association mail box with proof and photo. II. Call or mail the Association address to request the membership applicant form. 3. As soon as the applicant remits the payment, please call or E-mail for confirmation and notify us about the last five digits of your bank transfer. 4. If the confirmation is done, we will call or E-mail to you. The official receipt will be sent to you via surface mail to the address you provide. If you have not received the receipt within 2 weeks, please contact us. Thank You for Your Support and devotion for Taiwanese Association of Sign Language Interpreters.